It's A Dan's World: NO DOOZER'S ALLOWED: Fraggles And Planet Of The Apes Go BOOM! 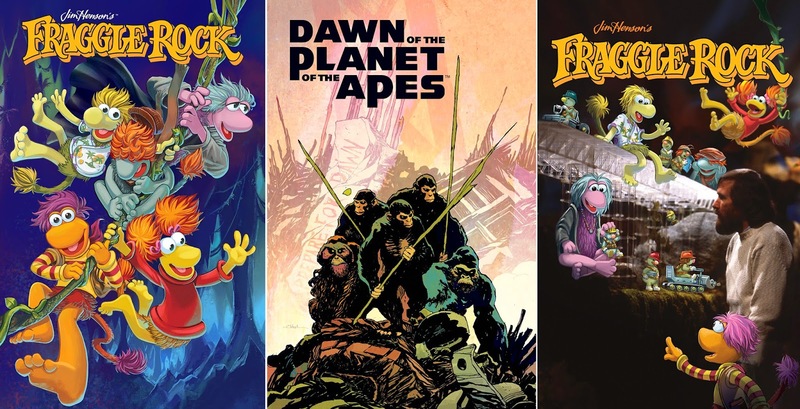 NO DOOZER'S ALLOWED: Fraggles And Planet Of The Apes Go BOOM! If you swapped ink and crazy compositions for a material shop full of string and fabric, its easy to see the late Jim Henson as a Jack Kirby of the puppeting world. Both masters of imagination, whose works are entertaining long after their namesakes have passed on. Now, one of Jim's landmark works, Fraggle Rock, is bringing it's 80's zaniness to BOOM! Studios. Launching October 8th, Fraggle Rock: Journey To The Everspring will be an all-ages fun, four-issue mini-series by writer Kate Leth and artist Jake Myler. Tackling a Fraggle Rock where the water has run dry, a team of brave Fraggle's must journey where no Fraggle has gone before to find both adventure and the fabled Everspring, to get things flowing again. Slightly on the Dark Crystal side of life, Dawn of Planet of The Apes will debut in November, also a mini-series, and yes, based on the latest movie from Fox. Bridging the 10-year gap between this film and the previous blockbuster Rise of the Planet of the Apes, the six issues will chart mankind's devolution, and the resultant rise of Caesar's apes, as Malcolm searches for a cure to what is killing his wife Rita. For those attending Comic Con 2014, they can pick up an exclusive one-shot Dawn of the Planet of the Apes: Contagion, exclusively from the BOOM! Studios booth. So Ape, Human or Fraggle - where do your loyalties lie? gonna see Planet of The Apes in S.F. tomorrow with my girlfriend i'll let you know how it was. ok so I saw it earlier today I just love watching a movie that takes place in the same city I happen to be watching it in like with Godzilla. anyways, I give it a thumbs up it was a good sequel to Rise of The Planet of The Apes. Thanks Dave - glad you liked it Mr!